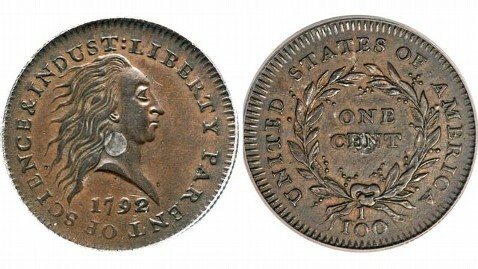 A 1792 Silver Center penny is being auctioned off Thursday night and online bidding is already at $1.15 million, according to Heritage Auctions. Also what makes this coin rare is that it doesn't have the usual "In God We Trust" that are seen on pennies today. Instead, the coin says "Liberty Parent of Science & Industry." "At the time, industry and science reflected an enlightenment mindset," Imhof said. "People believed freedom of thought and industrial growth would bind and unify the new country, not religion or God." The coin comes from a collector who wishes to remain anonymous. He has owned the coin for 10 years and paid far less than what the coin is expected to bring in at tonight's auction, Imhof said. "With collectible items, for an item to sell for over a million dollars it is an unusual event," Imhof said. A coin of the same type sold over a year ago for close to $3 million, Imhof said. Under 30 coins in history have sold for more than $1 million in public auction. This lucky penny could be yours Thursday at 7 p.m. at the Renaissance Schaumburg Convention Center in Schaumburg, Ill. The live auction is part of the Central States Numismatic Society Convention, one of the largest coin conventions of the year. "Lots of people have come here just to see this," Imhof said. "It could be a once in a lifetime opportunity for people to see it, hold it in their hand, and watch it sell."